THIS MANAGEMENT SERVICES AGREEMENT (the “Agreement”) is made and entered into effective as of ______________, 20__, by and between Medical Management Associates, Inc., a ___________ corporation (“Company”) and _______________ M.D., A Professional Corporation (“Physician”). The term “Physician” shall be deemed to also include __________________, the sole shareholder of _____________, A Professional Corporation, whenever the context so requires. A. Physician owns and operates a medical practice specializing in preventative medicine. Part of Physician’s practice includes the operation of a “wellness center,” located at ___________________________, ___________ (the “Wellness Practice Site”), at which Physician offers a variety of wellness, fitness, therapeutic and related programs and services (“the “Wellness Practice”). Attached hereto as Exhibit “A” is a list of the Wellness Practice services Physician provides at the Wellness Practice Site. B. Company has special expertise and experience in the management of wellness centers, including wellness centers of the type operated by Physician. C. Company desires to provide Physician with the necessary support to manage the business aspects of the Wellness Practice so that Physician can concentrate on the development of the professional aspects of the Wellness Practice. D. Physician desires to obtain from Company, and Company desires to provide to Physician, certain management services, as set forth herein, subject to the terms and conditions of this Agreement. a. Day-to-Day Management. Physician hereby appoints and engages Company as its sole and exclusive agent to manage and administer the day-to-day business functions and services related to the non-medical aspects of the Wellness Practice. Company’s performance of the Services shall involve such expenditure of time as Company determines is necessary or advisable in its reasonable discretion. Notwithstanding the appointment and engagement of Company to provide the Services, Physician shall have the exclusive authority and control over the professional aspects of the Wellness Practice to the extent the same constitute or directly affect the practice of medicine, including but not limited to all evaluations, diagnoses, treatment and ethical determinations that are required by applicable law to be decided by a physician. Physician acknowledges that Company provides management services to other physicians and medical groups, and agrees that Company may continue to do so throughout the term of this Agreement. Physician further acknowledges and agrees that, in addition to its management company business, Company conducts a separate business providing wellness services and goods that are not legally required to be provided or supervised by a physician (the “Company Wellness Business”). Company will conduct the Company Wellness Business at the Wellness Practice Site; however, Physician acknowledges and agrees that it shall have no interest in the Company Wellness Business, except as agreed to by Physician and Company in writing. i. Company shall employ and provide to Physician such non-medical personnel services, including a receptionist, patient counselor, secretarial and transcribing personnel, management and purchasing personnel and janitorial and maintenance personnel, as Company determines to be necessary or appropriate, after consultation with Physician, for the efficient and proper operation of the Wellness Practice (collectively, the “Support Personnel”). Physician shall be solely responsible for employing or engaging, at Physician’s sole cost and expense, any and all physicians and other licensed healthcare personnel (collectively, “Healthcare Personnel”) necessary or desirable for the operation of the Wellness Practice. ii. Company shall be responsible for the hiring, supervising, training, disciplining, and termination of the Support Personnel, including making all determinations regarding the retention, promotion, demotion, awarding of bonuses, salary adjustments and other matters affecting the terms and conditions of the employment or engagement of the Support Personnel in accordance with and subject to such personnel policies as may be adopted from time to time by Company. Staffing levels, work hours and shifts and employee benefit programs shall be established and implemented by Company in accordance with the policies and funding arrangements developed by Company. Company shall periodically review and evaluate the performance of the Support Personnel and shall use reasonable efforts, after considering Physician’s comments and suggestions, to reassign, terminate, or make scheduling changes of any Support Personnel who are incompatible with Physician. iii. Company shall be responsible for compensating the Support Personnel, and shall provide payroll accounting services and maintain employee records, workers’ compensation insurance, unemployment insurance, and such employee benefit programs for the Support Personnel as it determines are necessary or advisable in its sole discretion. iv. Although Physician shall be responsible for compensating itself and all other Healthcare Personnel and shall maintain such employee benefit programs as it determines are necessary or advisable in its sole discretion, Company shall be responsible for administering the payment of compensation to Healthcare Personnel providing Wellness Practice services, including providing payroll and accounting services, preparing checks for the signature of Physician and maintaining employee records. Company shall also administer the payment of all applicable vacation pay, sick leave, and retirement, health and life insurance benefits provided by Physician, at Physician’s sole cost and expense, to the Healthcare Personnel. i. Company shall provide, or arrange for the provision of, all billing and collection services that Company reasonably determines are necessary or appropriate in connection with the charges resulting from the performance of Wellness Practice services by Physician and the Healthcare Personnel. In connection with the billing and collection services to be provided hereunder, Company, or the third party engaged to provide such services, shall prepare invoices; input billing information; prepare computerized billing statements; submit claims to third party payors; and respond to telephone inquiries from patients and payors concerning patient bills. Company shall have discretion to compromise, settle, write off or determine not to appeal a denial of any claim for payment for any particular professional service rendered on behalf of the Wellness Practice. Company may also refer unpaid bills to collection agencies or attorneys for collection, provided, however, that the cost and expense of such collection agencies or attorneys shall be borne solely by Physician. Company shall deposit all payments into the “Non-Governmental Payors Account” or the “Governmental Payors Account” (collectively, the “Bank Accounts”), as appropriate, as further described in Section 2.a. below. Company shall provide monthly and year-to-date reports showing all billings, collections, and accounts receivable and the aging of same. ii. Physician hereby appoints Company for the term of this Agreement as its true and lawful attorney-in-fact for the purposes specified below. The foregoing power of attorney is coupled with an interest, and shall be irrevocable during the term of this Agreement or while Company is owed its Management Fee. 1. To bill in Physician’s name and on its behalf, (a) patients; (b) any third party payors; and (c) any other persons or entities who are obligated to pay for Wellness Practice services performed by Physician and the Healthcare Personnel. 2. To collect in the name of Physician and on its behalf all charges, fees or other amounts resulting from or related to the Wellness Practice professional and ancillary services performed by Physician at the Wellness Practice Site. 3. To receive all payments arising from Physician’s provision of Wellness Practice professional and ancillary services; take possession of and endorse in the name of Physician all cash, notes, checks, money orders, insurance payments and any other instruments received as payments of accounts receivable of Physician in connection with the Wellness Practice, however arising, and deposit all such payments in either the “Non-Governmental Payors Account” or the “Governmental Payors Account,” as such terms are defined in Section 2.a. Physician shall immediately forward to Company, and insure that the Healthcare Personnel immediately forward to Company, any such payments that may come into its or their possession. Physician hereby expressly authorizes and grants Company the right to open any mail or messengered envelopes or packages sent by any Wellness Practice patient or third party payor with respect to Wellness Practice services and which lists Physician as the addressee. Physician agrees that it shall not attempt to stop, hinder, interfere with, re-direct or divert any claims, payments or explanation of benefits in connection with Wellness Practice services, whether submitted or paid in a written form, by facsimile or electronically. 4. To deposit all “Gross Revenues,” as such term is defined in Section 2(a) below, directly into the appropriate Bank Account. i. Title to all of the Wellness Practice Equipment owned by Company shall remain in Company at all times, and upon the termination of this Agreement, Physician shall surrender the Equipment to Company in as good condition as it is in as of the date hereof, subject to normal wear and tear. ii. Company shall maintain and repair, or arrange for the maintenance and repair of, the Equipment, other than damage caused by the negligence or willful misuse of the Equipment by Physician, provided, however, that Physician shall use reasonable efforts to prevent damage to and excessive wear and tear of the Equipment, and shall promptly advise Company of any needed repairs or damage to any item of the Equipment. If Company determines that any existing item of Equipment utilized in Physician’s Wellness Practice is worn out or obsolete and that it is unreasonable, impossible or economically impractical to repair, and if Company further determines, after consultation with Physician, that such item is necessary or appropriate for the efficient operation of Physician’s Wellness Practice, then Company shall purchase or lease Equipment which is the same model or functional equivalent as the item to be replaced. iii. Company shall be responsible for payment of all property taxes and other assessments relating to or arising out of the ownership or use of the Wellness Practice Equipment that accrue on or after the date of this Agreement. e. Supplies. Company shall order and purchase such non-prescription, medical and office supplies as are reasonably necessary in connection with the operation of the Wellness Practice. In ordering supplies for Physician, Company shall consult with Physician from time to time. i. Company shall provide to Physician, at its sole cost and expense, the premises defined as the “Wellness Practice Site” in Recital A above, together with all appurtenances, improvements and fixtures, at which Physician shall conduct the Wellness Practice. Changes in location of the Wellness Practice Site may be effected by Company after consultation with Physician as of the expiration of any lease or other arrangement by which Physician leases or occupies the Wellness Practice Site or at any other time as may be approved in writing by Company after consultation with Physician. ii. Company shall provide or arrange for all of the lessee maintenance and repair obligations for the Wellness Practice Site that are required to be performed pursuant to the terms of the Wellness Practice Site lease between Company and its landlord, and any and all other maintenance and repairs to the Wellness Practice Site which Company, after consultation with Physician, determines to be necessary. iii. Company shall provide or arrange for all utilities and building services related to the utilization by Physician of the Wellness Practice Site. iv. Physician acknowledges that Company is the owner of the name, “________” and any related or similar names, derivations thereof or trademarks (collectively, the “Name”) and has the right to use the Name in connection with Company’s business. Company hereby grants to Physician a revocable license to make reasonable use of the Name in connection with the Wellness Practice conducted by Physician at the Wellness Practice Site. 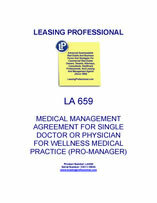 Physician acknowledges that this Agreement gives Physician only a conditional right to use the Name, which right shall automatically expire, without notice or further action by Company, upon the expiration or early termination of this Agreement for any reason, by either party, and Physician shall immediately cease using the Name in connection with the Wellness Practice. Further, unless Physician obtains the prior written consent of Company, Physician agrees to not use, or allow others to use, the Name in connection with any other business or professional practice he or others may conduct. Physician shall cooperate fully with Company in completing, renewing and filing any documents that must be submitted to the Medical Board of ___________, and any fictitious business name statement related to the Name, to evidence Physician’s agreement to the provisions contained in this Section 1(iv), including signing the Application for Cancellation of Fictitious Name Permit attached hereto as Exhibit “B” and incorporated herein by this reference. g. Advertising and Marketing. Company shall assist Physician in advertising and marketing the Wellness Practice services provided by Physician at the Wellness Practice Site. In assisting Physician, Company shall provide, at its sole cost and expense, general advertising and marketing services, which may include the preparation of, or contracting with third parties for the preparation of, signs, brochures, letterhead, ads and other marketing materials for Physician, subject to Physician’s prior approval (all such advertising and marketing services shall be referred to collectively herein as the “Advertising Services”). In providing such Advertising Services, Company is acting solely in its capacity as administrator of the Wellness Practice. At no time shall Company hold itself out as providing, or actually provide, Wellness Practice services on behalf of Physician. Company shall be the owner and holder of all right, title, and interest in and to all marketing, advertising and public relations materials created or implemented on behalf of Physician in connection with the Wellness Practice Services. h. Bookkeeping and Accounting Services. Company shall provide Physician with such bookkeeping and accounting services as Company determines are necessary or appropriate for the efficient and proper operation of the Wellness Practice. Such services may include the maintenance, custody and supervision of medical records, as further discussed in Section 6.a. ; custody and supervision of business records, papers, documents, journals and reports relating to the business operations of the Wellness Practice; the establishment, administration and implementation of accounting procedures, controls, forms and systems; the preparation of unaudited financial statements; and the processing and payment of Physician’s accounts payable relating to the Wellness Practice. i. Additional Services. If Physician desires that Company provide services in addition to those listed in this Section 1, and Company desires to provide such additional services, the parties may negotiate for Company to provide such additional services on such terms and for such additional compensation as the parties may agree upon in writing.